Spring is in the air and USTA leagues are organizing in all areas of Wisconsin. Captains meetings will be held in Madison and NEL areas in March. SEL and NCL will hold their Captain’s meetings in April. Milwaukee and LaCrosse will hold their captain’s meetings in May. League play in all areas will begin in May. Click on USTA League Tennis on the menu and then click on your county for league information specific to your community. Again this year, the Wisconsin Tennis Association is offering a rebate for new USTA memberships. If you were not a USTA member in 2008, you are eligible for a rebate. There is a link to the REBATE form on the home page. I’m seeking a co-local league coordinator for the North Central League area	-	Wausau, Stevens Point & Marshfield. Susan Balliet, the current LLC, is retiring May 1. Please contact me if you would like more information. Do you know which of the 21 Wisconsin Local League Coordinators has served the longest? Send me your answer:	judyveloff@charter.net. Do you live in a community outside of a major area like Milwaukee or Madison and would like to play USTA league tennis closer to home? The Tri-level and Combo Doubles formats work well in smaller communities. These formats use combined ratings so friends with different skill levels can play together on the same team. We have had	these successful & fun leagues in Baraboo, Sauk/Praire, Janesville, Fort Atkinson and Stoughton. We would like to expand these offerings to more areas. Please let me know if you would like to participate and if you could help organize a league in your community. Please contact me if you have any questions on USTA League Tennis or if you need help find a team. HAVE FUN! PLAY USTA LEAGUE TENNIS! As of November 8th, 9519 players have registered on teams to play USTA League Tennis in seven areas of Wisconsin. This is an increase of 267 over November, 2007 and 136 more then the final number for 2007 of 9383. We are on track to finish this year at about two percent higher participation than 2007. While our retention, 76.37% is 98% of last year, at this time Wisconsin is currently number ONE in the Midwest Section for unique participation at 5171. These two teams are traveling to Orlando, Florida on November 20-23. 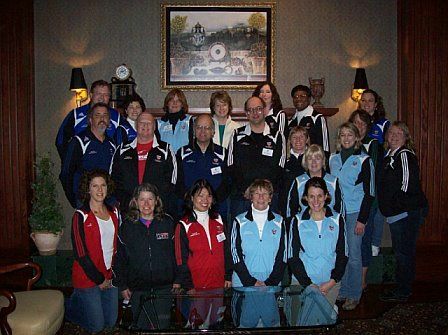 Today, November 8th, Wisconsin defeated Northern Michigan for the opportunity to represent the Midwest Section at the National Tri-Level Tournament in Indian Wells, California, in March 2009. This is a three-peat for the Wisconsin Tri-level team. I wish to express a sincere THANK YOU to my 22 Local League Coordinators who volunteer their time to grow the game of tennis in their areas. Six LLC’s are retiring – Lisa Treinen & Donna Nisleit from GML, Bob & Jane Breun and Kathy Karofsky from MALT and Boyd Chessman from NEL. GML – Sue Chavin, Lois Darkow, Essie Herron, Charlie Kordus, Julie Meidam & Jack Shepich. – 4448+ players. LaCrosse – Dale Barclay and Emily Kirchner – 112+ players. Madison – Dawn Blau, Steve Heusinger, Lori Lukens, Joan Mohr, John Montognese, Lisa Sanchez and Jan Westemeier – 3245+ players. SEL – Arlene Adams – 273+ players. Northwoods:	LLC, TBA – 14 players. The league numbers with plus signs mean that those areas have leagues still registering players. USTA league tennis in Wisconsin is no longer just a summer season league. Most areas offer players the opportunity to participate in USTA league tennis all twelve months of the year. THANK YOU FOR PLAYING USTA LEAGUE TENNIS!!! USTA League Play is beginning this month in all corners of Wisconsin. ADULT AND SENIOR LEAGUE play must be completed by August 3rd so that league winners are ready to advance to the USTA STATE TOURNAMENT on August 8 – 10 at Nielsen Tennis Center in Madison. The Wisconsin Tennis Association pays team entry fees for these tournaments. Leading teams should be aware that if they win, they will be expected to advance to represent their Areas and Wisconsin. If there is a team that cannot field the minimum number of players at either of these tournaments, their Local League Coordinator must be made aware within 24 hours of the end of league play so that the second place team may be given the opportunity to advance. LOCAL LEAGUE PLAY DOES NOT END IN AUGUST there are more USTA League opportunities in late summer and fall. There are Tri-level, Combo and Senior Mixed leagues available in all areas of Wisconsin. If you have any questions, contact	your Local League Coordinator. THANK YOU FOR PLAYING USTA LEAGUE TENNIS! LOCAL LEAGUE COORDINATORS ARE READY TO SERVE!!!!!!!!!!!! Wisconsin Local League Coordinators attended the annual workshop on February 9th	which kicks off the new league season. Local League Coordinators are responsible for organizing leagues, finding captains, making sure all players get on a team, producing schedules and supervising league match play. Each area of Wisconsin has a variety of leagues to choose from: traditional adult, mixed doubles, senior, tri-level, combo, senior mixed and super senior. Leagues in most areas begin as early as January and continue through the fall. There are leagues for tennis players of all ages and abilities. Tri-level leagues are forming in Madison, Appleton and Milwaukee. Players say that participating in Tri-Level leagues is a good way to warm-up for summer competition. The first annual TRY Tri-Level Tournament in the Wausau area was a huge success – except for the first major snowstorm that hit on the same weekend. Madison had to come up with some players at the last minute because of the weather and Wausau was happy to help out. It is nice to know that in a pinch there are so many great, reliable players in the Wausau area who were willing to come through and help out with some of the matches. Out of the 24 matches scheduled for the weekend, only two had to be forfeit and one of those was due to injury. After the matches on Saturday, the players were treated to a wonderful gathering at the Voss home. They had great fun. Players were all able to get to know each other in a social setting off the tennis courts. By Sunday, they were all old friends. For Wausau, it was great to introduce some of the men to USTA. There have been no men’s teams participating in the North Central Area. They all went away from the weekend with very positive feelings toward league tennis. There were a few players who just came to watch. All wanted to be included in the next tournament. The local league coordinator, Susan Balliet, is hoping to capitalize on this for the summer. The North Central League will host the first ever TRY TRI Tournament which will include men’s and women’s doubles matches and MIXED doubles. A Madison team is traveling to Wausau on December 1 and 2 to challenge Wausau. Another first – The State Tri-level tournament will be held January 5 & 6, 2008, in Madison.